The elephant and the machine gun. I just love this photo; it’s utterly bonkers! 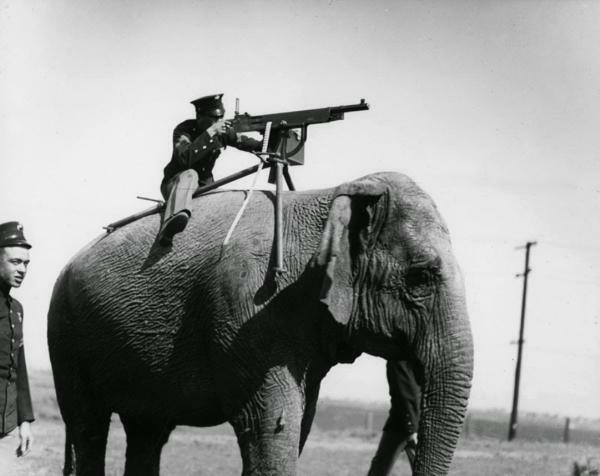 Taken in an unknown location in 1914, it depicts a US Corporal aiming a Colt M1895 atop a fully grown Sri Lankan elephant. I would wager that the brave Corporal has not attempted to fire the machine gun, as I doubt the placid looking beast he rides would appreciate the clatter and shock of having 450 round a minute dispensed so close to his lug holes. The elephant looks suitably unimpressed! Perhaps he has never seen Far Cry 4, or the Lord of the Rings films?